The best-selling house author of the monastery of Monkwearmouth-Jarrow, the Venerable Bede (c. 672-735) is most well-known for his 'History of the English Church and People.' He wrote a number of biblical commentaries as well, including one on the Catholic Epistles. This copy belonged to the library of Durham Cathedral, where his tomb is still located. 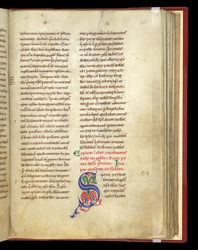 On this page, the commentary on Chapter 1 of the Letters of Peter end, as indicated by the title in red with first letter green ("explicit"), and Chapter 2 begins ("incipit"). The text of the letters of Peter begin with a large, colourful first letter. The coloured and decorated letters were aids to help the reader recognise divisions in the text. Further help comes in the margins, where the marks which look like the letter 'q' indicate paragraphs and a kind of running index is provided in the form of subjects, such as "Peter venerated in Rome."